“Now, My daughter, listen to Me and pay attention. I want to tell you a Great Surprise of Our Love, and nothing must escape you. I want you to know the extent of the Maternity of My Celestial Mother—what She did, how much it cost to Her, and what She is still doing. You must know that the Great Queen was not My Mother only in Conceiving Me, delivering Me to the light, feeding Me with Her milk, and offering Me all the possible cares that I needed during My Infancy; this was not enough, either to Her Maternal Love, or to My Love as her Son. Her Maternal Love was always running through My Mind, and if Sorrowful thoughts were troubling Me, she laid Her Maternity in each one of them, hiding them inside Her Love and kissing them. I could always feel My Mind as if it was hidden under Her Maternal Wings, that never left Me alone; each one of My Thoughts was kept by My Loving Mother, who gave Me all Her Maternal attentions. Her Maternity was placed in each one of My Breaths and heartbeats; and if My Breath and heartbeats felt smothered by My Love and suffering, She would run with Her Maternity to free Me from My suffocating Love and put balm on My Pierced Heart. If She looked, spoke, worked and walked—She ran, as a Mother, to receive in Her Maternal Love My Glances, Words, Works and steps, Investing them with Her Love and hiding them in Her Heart. She would also make Her Maternal Love flow in the food She prepared for Me, so that while eating it, I could feel Her Loving Maternity. How much more could I tell you of the expression of Her Maternity in My sufferings? There was not a Pain, not a drop of the Blood I shed that was not felt by My Mother. But after doing these things as My Mother, She would then take all My Pains and My Blood, and hide them inside Her Maternal Heart to Love them and continue Her Maternity. “Who could say how much She Loved Me and how much I Loved Her? My Love was such that in everything, I could not be without feeling Her Maternity within me. I can say that She would run, never to leave Me alone, not even in My Breathing. And I called her. Her Maternity was for Me a need, a relief, a support for My Life down here. “Now, My daughter, listen to another Love Surprise of your Jesus and of our Heavenly Mother. In all We did, Love was never obstructed between Us; the Love of one ran into the Love of the other to form One Single Life. But in wanting to do the same with creatures, how many obstructions, rejections, ingratitudes do we find. You must know that as My inseparable Mother laid Her Maternity inside and outside of My Humanity, so She was made and Confirmed as Mother of every thought, every breath, every heartbeat and word of creatures, placing Her Maternity in their works, in their steps and in all their sufferings. Her Maternity runs everywhere. If creatures are in danger of falling into sin, she covers them with Her Maternity to prevent them from falling; and if they do, she leaves Her Maternity as help and defense, to make them stand up again. Her Maternity runs and lays also on the souls who want to be good and holy, as if She found Her Jesus in them. 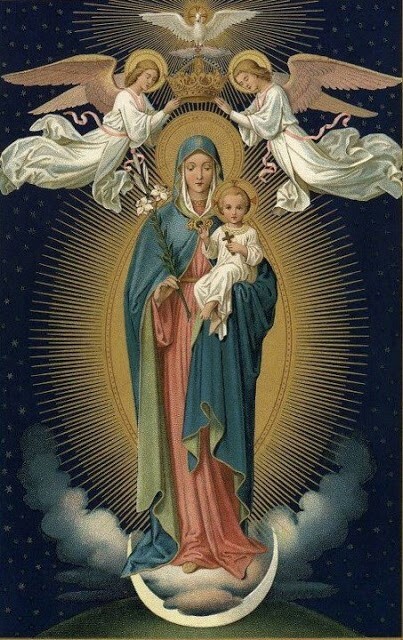 She becomes Mother of their intelligence, and Guide of their words, covering and hiding them in Her Maternal Love, in order to grow as many other Jesuses. Her Maternity shows on the beds of the dying. Using the rights of authority as Mother given to Her by Me, in such a tender tone that I cannot refuse Her anything, She says: ‘My Son, I am the Mother, and they are My children; I must save them. If You don’t grant Me this, My Maternity would be compromised.’ And as She says this, She covers them with Her Love, hiding them with Her Maternity to rescue them. “My Love was such that I told her: ‘Mother, I want you to be the Mother of all, and I want you to do for all creatures all that you have done for Me, laying your Maternity in all their acts so that I will see them covered and hidden in your Maternal Love.’ My Mother accepted and remained Confirmed, not only as the Mother of all, but also as the One who would Invest each of their acts with Her Maternal Love. This was one of the Greatest Graces I have given to the whole of human generations. But what Pains does My Mother not receive? Creatures even reach the point of not wanting to recognize Her Maternity—of denying it. Therefore the whole of Heaven prays and anxiously waits for the Divine Will to be known and to Reign. Then, the Great Queen will do to the children of My Will what She did for Her Jesus, and Her Maternity will have Life in Her children.